2 cups gram flour (besan). 2 tbsps chopped corriander leaves. 1 tbsps chopped methi leaves. 2 tsps green chillies(finely chopped) or green chilly paste. Take gram flour in a bowl, add all the ingredients, add water to get thick yet dropping consistency batter, mix well. Drizzle little oil around the cheeley and cook on medium heat. 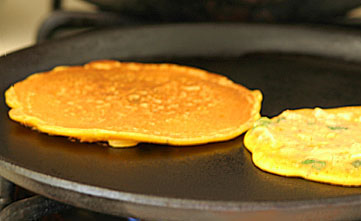 When underside is light golden, flip over and cook the other side till light golden. Hi Fatma, I really like your recipe we make the same but without onions, next time I will try making it with onions, F.Y.I. I am from Dar too.